A further item of excellent financial news in recent weeks as Okehampton United Charities reaffirmed its’ support for Okehampton Gym, Trampoline and DMT Club with a superb grant of £15,000 toward new equipment. Well done to Vicki who has been invited back as South West trampoline / DMT squad coach for a second season. Well done to everyone who competed at the trampoline and DMT regional team selection competition yesterday, in classes from NDP1 to the South West open! Okehampton Flyers Gym, Trampoline & DMT Club had another good day at their second South West trampoline and double mini trampoline (DMT) regionals this season, coming away with three gold medals, two silver medals and other high placings. OCRA Flyers had a good day at the Southern Zonal schools trampoline competition. Congratulations to Madison Vine, representing Launceston College, who came third in the year 7-9 intermediate grade and has qualified for the schools national final in Cannock, Birmingham. OCRA Flyers Gym, Trampoline & DMT Club had an excellent day at the South West regional trampoline and double mini trampoline competition in Bath on 20th January, coming away with four gold, two silver and two bronze medals and other top placings. Some more pictures of our youth competitors from the Summer (2018). Okehampton Gym, Trampoline & DMT Club took trampolines and a track into Simmons Park for Super Sporting Sunday to show the public some of the skills they have been learning at the club. 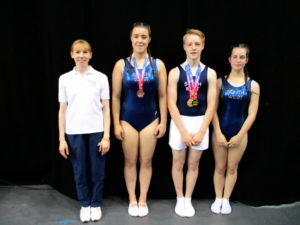 Flyers trampolinists have secured two British NDP titles at the individual trampoline, DMT and tumbling NDP finals, held at the Motorpoint Arena, Nottingham. Come along to our Adult Gym and Trampoline tonight for a fun way of keeping fit! With new equipment funded by Sport England. Every Thursday during term time, 8.30-9.30pm, in the Okehampton College Gym. Only £4 per session. 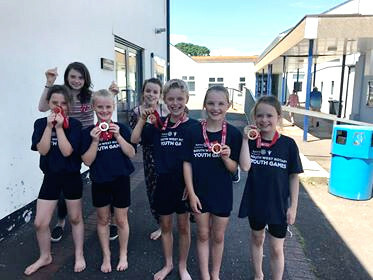 Congratulations to Okehampton Gym and Trampoline Club, who have taken six places in the South West trampoline and double mini trampoline squads. We are currently only permitted to enter 2 gymnasts into regional competitions, and 4 gymnasts into county competitions as we have no qualified officials. We have many children in the club who would like the chance to compete, but to enable them to do this, we need parents to qualify as tumbling, DMT and trampoline judges and to be prepared to judge on competition days. If you’re interested in qualifying as a judge, please contact Vicki at vicki@ocrasport.org.uk. Judging is very easy and we will pay for your course. Any help would be greatly appreciated! Following more fundraising, we were able to purchase a second hand DMT and landing area from Ringwood & Bournemouth Trampoline Club over Christmas. Both were used by several members of the GB DMT squad. The landing area is also perfect for tumbling. The Flyers had another great day at the October South West regional trampolining competition. At his first regionals, Owen Pitman achieved top form scores to secure second place in the NDP4 Men’s 13+ category. Miya Porter performed two quality routines to come 5th in the NDP3 Women’s 13+ class. Well done to both gymnasts! 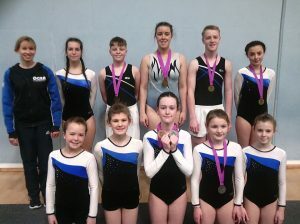 Okehampton Gym and Trampoline Club came away with more medals from the Whirlwinds competition in Taunton. Miya Porter was the first to compete in the NDP3 U14 competition, performing two excellent, controlled routines to second place. Owen Pitman won the NDP4 14+ class, with two stylish routines, finishing four marks ahead of the other competitors. We have teamed up with the Okey Cokey to run extra gymnastics sessions on Mondays and Fridays. The sessions are open to 3-4 year olds and currently run on Mondays, 11-11.40am and 12.20-1pm, with a new session to start soon at 11.40am-12.20pm. The Friday session is 11-11.40am. All sessions are £3. Children take part in fun warm up and stretching games and learn basic jumps, rolls and balances, as well as skills on apparatus including beam, springboard and vault. The Okey Cokey is a lovely venue with a café for parents to sit in while their children are doing gymnastics, and a play area for children to enjoy before or after the session. We still have spaces available, so if your son or daughter would like to come along, please contact vicki@ocrasport.org.uk to book. A big thank you to the Manor House Hotel for their generosity in purchasing a tumbling landing mat, soft play wedges and a soft play cylinder for Okehampton Gymnastics Club. The 3m x 2m landing mat will enable us to prepare our tumblers for competitions, and the soft play wedges and cylinder are versatile pieces of equipment that can be used for teaching rolls to pre-schoolers and more advanced skills to older gymnasts. 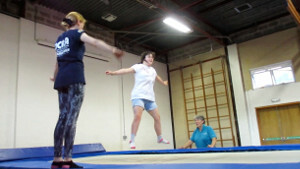 Okehampton Gym and Trampoline Club did more fundraising this summer with a Bounceathon on 19th August, where children could come along and learn skills on trampolines, trampette and air track at only £5 for two hours! The day was run entirely by volunteers so thank you to everyone for your hard work! Congratulations to the West Devon gymnastics team for coming first in the South West Youth Games gymnastics competition. Okehampton Flyers came away with more medals from the Griffin trampoline competition in Street on Sunday 18 June. 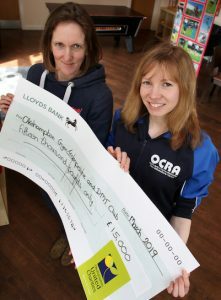 Our hard work raising money for a sprung tumble track has finally paid off! We were able to purchase a Continental sprung track in July, meaning we can prepare our gymnasts to enter tumbling competitions. OCRA Flyers Gym and Trampoline Club had a successful day at their first British Gymnastics Bath regional trampoline competition. Angus Bond won the NDP4 13+ class with two solid routines and a top score for range and conditioning. Miya Porter came 8th in the 11-12 NDP3 class, also with two excellent routines. Both gymnasts normally train on school trampolines, so they did well to adjust to the top level trampolines they had to compete on. To top a great day, they also met Olympic trampolinist Nathan Bailey. Flyers coach Vicki Pritchard said: “Both gymnasts did well at their first regional level competition, which is a big step up from county level. They have also qualified for the regional team selection event in March, so they are working hard to prepare for that”. The club has been raising money for equipment to give children in Okehampton and the surrounding area the chance to compete trampolining at a higher level and to compete tumbling. It still has a long way to go, so any donations or sponsorship would be greatly appreciated. For more information about the club, contact vicki@ocrasport.org.uk. Okehampton Gym Club ran its first club tumbling competition in December. The competition was a fundraising event to raise money for a sprung tumbling track to enable its more advanced gymnasts to enter regional level competitions. Okehampton Trampoline Club came away with four medals from the Griffin Trampoline competition in Street on Sunday 13th November. It was a busy competition with a friendly atmosphere. The trampolines were top level 6x4s and 4x4s, so the children did well to adjust to the bouncier trampolines with only three or four practice warm ups. Congratulations to the West Devon gymnastics team who won the Devon Games team gymnastics competition on 3rd July. The gymnasts were selected at area trials and performed a floor routine, a body management exercise comprising strength and flexibility skills and a vault exercise. The team selected for West Devon was Demelza Brock, Eloise Cole, Shea Coyle, Bethan Honey and Jonah Lynch, with Sienna Fuller and Trinity Bridger as reserves. Well done to the West Devon gym team Katie Chapman, Melissa Doble-Headon, Oscar Hughes, Poppy Twort and Adam Voaden, who secured a bronze medal at the Devon Youth Games with superb performances on floor, vault and body management. 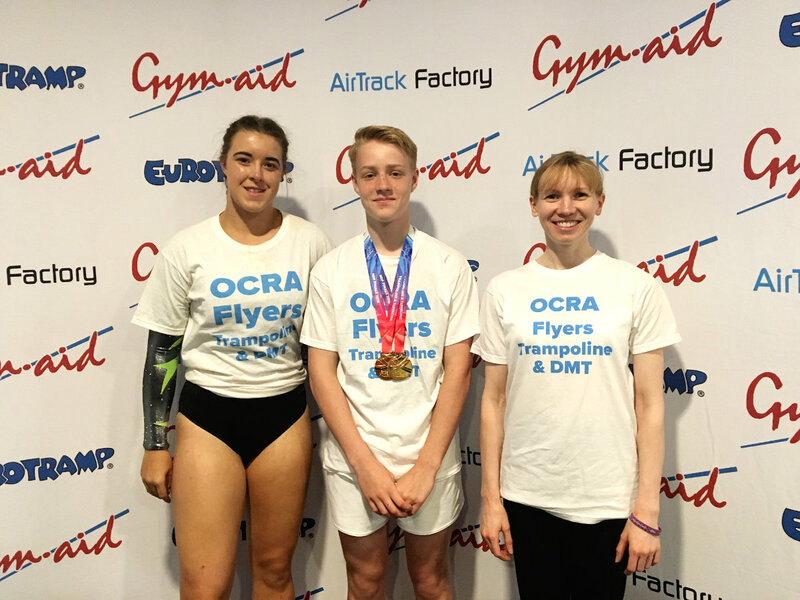 OCRA Trampoline Club topped their competition success last month (October 2015), coming home with an array of medals from the Honiton and Totnes friendly competitions and the Devon Championships. Congratulations to OCRA’s SNAP children for passing their trampoline and gymnastics proficiency awards. SNAP (Special Needs in the Park) is a fun, social club for children and young people with disabilities, that teaches fundamental movement skills through gymnastics, trampolining, dance and music. OCRA Trampoline Club came away with more medals from the Tornadoes competition in Totnes on 26th April. In her first competition, Sophie Wyer performed two excellent routines in the N1 category to win a bronze medal. Melissa Doble-Headon came 6th in NDP1, and William Bridges won a silver medal in the NDP2 category. Okehampton Trampoline Club had a successful day at the South Devon Flyers annual competition on 13th July, coming home with five medals. Most of the competitors are part of Okehampton’s new trampoline squad, which focuses on developing and training young trampolinists for competitions. Competitors have to perform two routines in front of a panel of judges. The scores are then added together to form the final mark. OCRA Trampoline Club has returned from the annual Honiton Hurricanes competition with more top results. With one gold medal, two silver medals and other high rankings, the young trampolinists outclassed many more experienced competitors.